After years of dreading the chore of washing my makeup brushes and trying to find the perfect quick, deep cleansing solution to all of my dirty brush woes, I finally have my routine down. 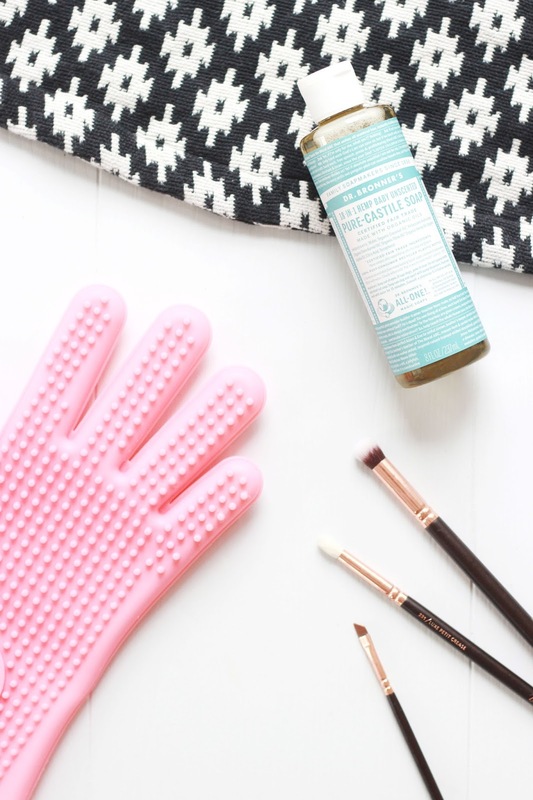 If I'm struggling with time and am after a speedy fix then spot cleaning is the way to go, but as I haven't found a brush cleaning spray that has knocked me off my feet, I tend to stick to my trusty deep clean ritual. More often than not I used to clean using any old shampoo, but then I discovered the Dr. Bronner's 18 in 1 Hemp Baby Pure Castile Soap and I never looked back. With a gentle formula and little scent, I find that this offering cares for my brushes and is much suited to my sensitive skin. Although this liquid soap is good, it's the Soap and Glory Massage Glove that really has the wow factor and makes the most difference during my routine. Not only does it protect your hands from the repetitive process of wash, swirl, rinse, repeat, but it also deep cleanses and gets rid of every bit of dirt. This soap and mitt duo is unbeatable and once they come in contact with water it takes only a few seconds to get my brushes spotless. Pure bliss for those who hate the brush cleaning chore. How do you clean your makeup brushes?